WHITE PLAINS—The constricting supply of housing in the lower Hudson region served by the Hudson Gateway Multiple Listing Service, Inc. has brought about some long-expected price increases in most areas and in most property types, according to the “2017 Second Quarter Residential Real Estate Sales Report for Westchester, Putnam, Rockland and Orange Counties, New York” report authored by the HGMLS. The recently released report noted that in Westchester, the second quarter median sale price of a single-family house was $670,000, an increase of $20,000 or 3.1% over last year`s level. The mean sale price of $900,000 was 7.0% more than last year, indicating the high-end sector may be reinserting itself into the sales mix. Westchester condominiums and cooperatives also enjoyed median price increases of 5.3% and 3.9% respectively. Orange County, long characterized by high sales volumes but flat prices, posted a second quarter single-family median price of $235,000, an increase of 5.6% from last year. 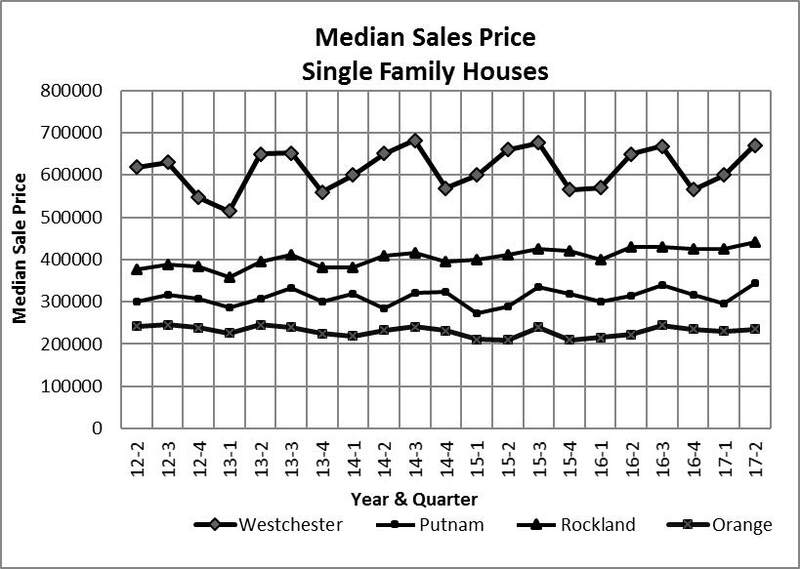 Rockland County’s median price at the end of the second quarter stood at $441,387, which represented a 2.6% increase. Putnam Country, having the smallest volume market of the four-county HGMLS region and subject to wide statistical swings, posted a second quarter median price at $345,000, which was a significant 9.9% increase over the same period last year. Prospective homebuyers were operating in a market that has seen tremendous reductions in the supply of for-sale housing over the past four years. At the end of 2014 there were 12,153 active listings posted with HGMLS in its service territory and among all of its property types—single-family houses, condominiums, cooperatives, and 2-4 multi-family units. By the close of the second quarter of 2017 that number plunged by more than 3,440 units to 8,713 or 28.3% fewer active listings. The double-digit percentage rate of shrinking inventory is continuing as new listings barely make up for high rates of sale. Realtors participating in HGMLS, a subsidiary of the Hudson Gateway Association of Realtors, Inc., reported a grand total of 4,726 closed residential transactions during the second quarter of 2017, an increase of 4.4% from last year. These sales largely reflect market activity during the winter and early spring months of this year. Westchester, the most populous of the serviced counties, posted 2,642 sales for an increase of just 1.0% over last year. Orange County posted an impressive 1,098 sales an increase of 13.8%, almost all of that in its single-family house sector. 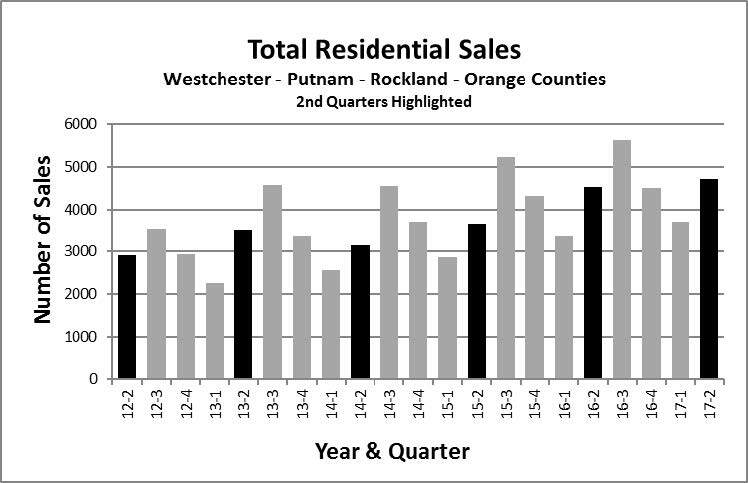 While Rockland County had a fair 3.8% increase in single-family sales, its best second quarter achievement was in its condominium sector where it posted a 33.6% increase in sales. Putnam County was the only county to report a decrease in single-family residential sales (5.1%) but an increase in residential sales price. There appear to be no obstacles to a continuation of a healthy Hudson Valley real estate market except for the shortage of inventory, which may inevitably drive prices higher or may diminish the volume of sales, or both. Those are the internal machinery of the market; we do not have negative external factors right now that are threatening. Some external factors in good standing with real estate include low mortgage interest rates, low unemployment, good job growth, and reasonable and well-paced increases in the Federal Reserve rates. Some negative factors include possible changes to the tax code affecting real estate, and chaotic governance that causes consumers, i.e., prospective homebuyers, to lose confidence in executing their homebuying intentions. Overall this report points to a thriving four-county housing market.